Enter information and select appropriate menus in under Input section, then click "Calculate". Calculates weight training workloads based on Actual Resistance including (a) light and heavy load variations, (b) weight increases [eg: +5%], and (c) warm-up resistances [50%]. 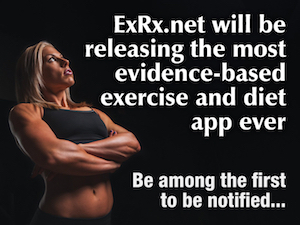 It also calculates expected repetition differences between varied loads much more accurately for many exercises which include a percent of body weight as a significant portion of the total resistance (eg: Pull-ups, Dips, Squats, Deadlifts, Leg Raises, etc.). Select exercise from list if a significant portion of body weight contributes to resistance. If a particular exercise does not appear in this list, keep default value set to 'Other Exercise', indicating the exercise does not include body weight as a significant portion of total resistance. Enter full body weight if exercise appears in the pulldown list. A precalculated portion of body weight will be used to estimate Actual Resistance. A Body Weight is not required if exercise does not appear in list. Other Exercise is selected by default. Negative number(s) can be used to depict an assisted weight (as in a machine assisted dip or pullup). Plan weight variation between light and heavy workouts or calculate weight increases to be used when upper rep range has been achieved. Weight output may be rounded to nearest whole number or nearest 5 units. The sum of added weight and a portion of body weight relative to added weight. See Calculating Actual Resistance. Recommended resistance for warm-up at 50% of Actual Resistance. For heavy exercises such as Squats and Deadlifts, an additional intermediate warmup set with approximately 75% of Actual Resistance is generally recommended. A negative warm-up resistance suggests performing the movement in a self-assisted exercise manner, or in some cases on a machine assisted exercises (eg: assisted pull-ups or dips). See weight training warm-up. Alternatively, a Percent of Bodyweight Adjusted One Rep Max can also be calculated by this field by entering a one rep max value into the Workout Weight field and selecting the desired percentage from the Warm-up Percentage pulldown. See rationale and examples of calculating Bodyweight Adjusted One Rep Max: Weighted Pullup and Squat. With the lighter weight, as dictated by the Reps / Percent Resistance Variation selection expect to perform more repetitions (+) relative to current performance, as displayed in the reps field next to this weight. This lighter load can be performed on a planned light day as in a non-linear periodized workout program. Calculates the number of reps difference (-) relative to current performance which can be expected to be achieved with the heavier weight, as dictated by the Reps / Percent Resistance Variation selection. This heavier load can either be performed on a planned heavy day or during a weight progression, after the upper rep range has been achieved (eg: 8-12 reps indicates weight to be increased once 12 reps are achieved).